ProfEC Ventus has taken out tubular wind met towers from its default product portfolio due to unnecessary, high operational costs associated, often occurring shortly after initial commissioning already, as explained below. ProfEC Ventus still does offer, provide and/or install tubular wind measurement towers for particular situations, where specific reasons justify or offset the increased operating costs. Hence, in case of a particular interest for tubular wind met masts, please contact us for advice or a specific quote. In essence one can conclude: as soon as a tubular tilt-up wind measurement mast needs to be laid and put down for the very first time after initial commissioning, its operational costs increase and quickly exceed any hardware cost savings archived during initial procurement if compared to a lattice wind tower structure of same height. Therefore we offer lattice masts by default, which are only marginally more expensive during procurement but significantly less expensive during operation. Nowadays tilt-up tubular wind met masts relevant for wind energy are available mostly from 60m to 80m height only. Higher masts are usually of lattice tower structure. Our experience in numerous countries all over the world has proven that operating costs for tubular tilt-up wind measurement masts often are significantly higher as if compared to operating costs for lattice wind met tower structures. Tubular tilt-up towers often can be installed during low wind speed windows only. As soon that wind speed exceeds approx. 6 m/s, it mostly is too dangerous to tilt up any tubular wind met mast, since the risk of mast, material or human loss simply is too high. Installation times for tubular masts can be lower, in case of low wind speed windows prevailing for most of the time. This in particular often is a problem, since wind farms and hence wind measurement campaigns usually are located at regions promising a high wind resource potential. 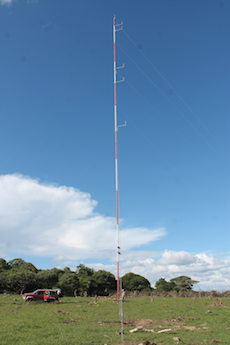 Therefore in general one can assume that low wind windows are less frequent at such locations, quickly driving up time and costs for tilt-up mast installations. As soon as a sensor needs to be exchanged or maintained, respectively repaired, a tubular tilt-up tower must be put down. Laying down a tubular mast almost takes as long as lifting a tubular mast and is subject to the same limitations in terms of low wind speed windows necessarily to be prevailing. After wind sensor repair, exchange or maintenance the tubular tower again needs to be tilted-up, for which again low-wind periods are needed. In accordance to IEC and MEASNET recommendations, and depending on the sensor type and site characteristics (e.g. saline and/or harsh environment), sensors should be re-calibrated and/or maintained after one year of wind measurement in the field. Often also lightning or other force major cause sensor defects before completing a one-year wind measurement campaign. Once a tubular mast would need to be tilted-down and tilted-up again, the operational costs usually exceed by far the initial cost savings achieved during procurement of a tubular tilt-up mast in comparison to a lattice mast. Tubular wind measurement masts usually do have a design lifetime of about up to 2-5 years. Lattice wind met masts often have a design lifetime of 5-10 years. It is understood that the design lifetime only can be reached if prudent and regular maintenance services and guy wire control are undertaken. The design lifetime is of particular relevance, if a wind measurement mast not only shall be used for assessing the wind resource potential but also for a potential power performance and verification later on, once wind turbines were commissioned a few years thereafter. At that moment a sound, lattice wind met tower could still be used for the purpose of power performance measurement and verification. Note: costs do not include hardware transport, international staff transport, heavy machinery rental, measurement system, any options etc. and assume an average, default installation scenario. Initial Commissioning Costs do include the crude mast hardware ,initial installation and commissioning incl. anchoring materials. Often the initial savings for a tubular tower in the beginning are offset already as early as after 9-12 months after commissioning, respectively as soon as the tubular tower would need to be tilted-down and laid on ground for the first event occurrence that makes works at upper mast members necessary.